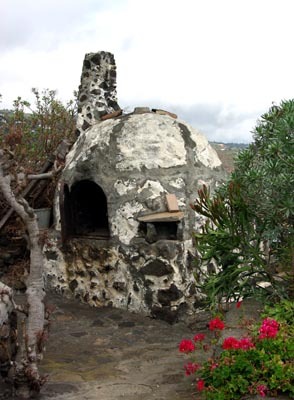 The Benahoaritas (or Auaritas or Awaras) were the people who lived on La Palma before the Spanish invasion. They lived in caves and wore animal skins, but they farmed, and they had ceramics. 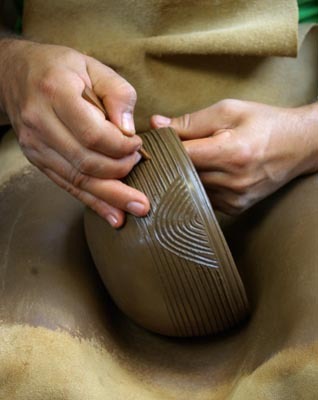 The older ceramics are simpler, and the newer ones usually more decorated. At El Molino, in Mazo, they make replicas of these ceramics. The business was started by Ramon and Vina, but these days they’re retired and other people work there. 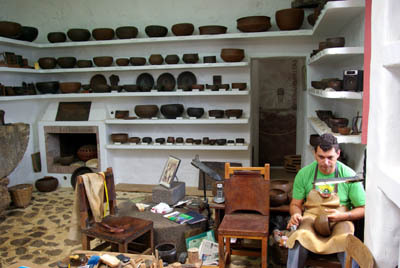 Each design — usually a bowl — is an exact copy of a object made before the Spanish invasion in 1492. The walls of the workshop are lined with the reference pieces, each one labelled with the place where the original was found. The finished items are for sale in the shop, and prices range from €12 to €200. They also sell a good variety of souvenirs. 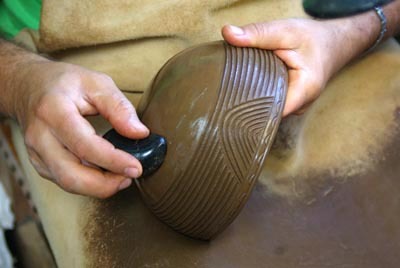 Smoothing the bowl with a pebble. The workshop is in an old windmill. To get there, take the road from Santa Cruz to Fuencaliente which passes below Mazo, and look out for the signs and the windmill’s sails. The windmill also houses a small museum (more in another post) and it’s set in a beautiful garden. The kiln at el Molino where the finished pieces are fired.